Elizabeth Osborne King was an internationally known American microbiologist who discovered and described bacteria of medical importance at the United States Centers for Disease Control and Prevention from the late 1940s through the early 1960s. The genera Kingella and Elizabethkingia and the species Kingella kingae are named to honor her for her pioneering work. Osteomyelitis (OM) is an infection of bone. Symptoms may include pain in a specific bone with overlying redness, fever, and weakness. The long bones of the arms and legs are most commonly involved in children, while the feet, spine, and hips are most commonly involved in adults. There are four species of Kingella: K. kingae, the most common, is part of the bacterial flora of the throat in young children and is transmitted from child to child. When it causes disease, the clinical presentation is often subtle and preceded by a recent history of stomatitis or upper respiratory infection. Other species are K. indologenes, K. denitrificans (both causing endocarditis) and K. oralis found in dental plaque. The pharynx is the part of the throat behind the mouth and nasal cavity and above the oesophagus and larynx, or the tubes going down to the stomach and the lungs. It is found in vertebrates and invertebrates, though its structure varies across species. The organism has also been known as Moraxella kingae. K. kingae is oxidase-positive, catalase-negative, and beta-hemolytic. Kingella kingae is thought to begin infection by colonizing the pharynx, crossing the epithelium by using an RTX toxin, and entering the circulation and reaching deeper tissues, such as bones and joints. 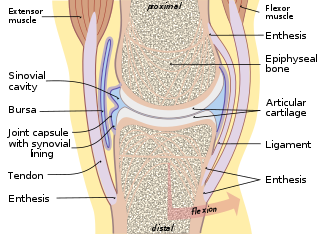 The synovial membrane is a specialized connective tissue that lines the inner surface of capsules of synovial joints and tendon sheath. It makes direct contact with the fibrous membrane on the outside surface and with the synovial fluid lubricant on the inside surface. In contact with the synovial fluid at the tissue surface are many rounded macrophage-like synovial cells and also type B cells. Type A cells maintain the synovial fluid by removing wear-and-tear debris. As for type B cells, they produce hyaluronan, as well as other extracellular components in the synovial fluid. Osteomyelitis occurs in previously healthy children. The infection rate is poorly documented, thus the illness tends to go underdiagnosed. K. kingae can be transmitted person to person in rare cases. Diagnostic tools include low-grade fever, elevated inflammatory markers (ESR and CRP), but white blood cell counts are generally unreliable since they vary among infected patients. K. kingae infections are generally comcomitant with upper respiratory diseases or stomatitis, since disrupted respiratory or buccal mucosa is likely to facilitate bacterial invasion and hematogenous dissemination. 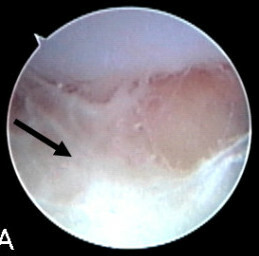 The cause of osteoarticular infections is frequently not identified. Less than 15% of K. kingae-positive clinical specimens reveal organisms on Gram stain. Infections due to K. kingae are treatable with a wide variety of antibiotics, such as beta-lactams, tetracyclines, erythromycin, and fluoroquinolones. Minimum inhibitory concentrations of penicillins, rifampicin, and azithromycin are easily achieved. Multiple studies have shown that inoculating synovial fluid or bone samples directly into blood culture bottles substantially increases the detection of K. kingae compared with direct plating of specimens on solid media. The HACEK organisms are a group of fastidious gram-negative bacteria that are an unusual cause of infective endocarditis, which is an inflammation of the heart due to bacterial infection. HACEK is an abbreviation of the initials of the genera of this group of bacteria: Haemophilus, Aggregatibacter, Cardiobacterium, Eikenella, Kingella. The HACEK organisms are a normal part of the human microbiota, living in the oral-pharyngeal region. Staphylococcus lugdunensis is a coagulase-negative member of the genus Staphylococcus, consisting of Gram-positive bacteria with spherical cells that appear in clusters. Subacute bacterial endocarditis is a type of endocarditis. Subacute bacterial endocarditis can be considered a form of type III hypersensitivity. Flucloxacillin, also known as floxacillin, is a narrow-spectrum beta-lactam antibiotic of the penicillin class. It is used to treat infections caused by susceptible Gram-positive bacteria. Unlike other penicillins, flucloxacillin has activity against beta-lactamase-producing organisms such as Staphylococcus aureus as it is beta-lactamase stable. However, it is ineffective against methicillin-resistant Staphylococcus aureus (MRSA). It is very similar to dicloxacillin; they are considered interchangeable. Pantoea agglomerans is a Gram-negative bacterium that belongs to the family Enterobacteriaceae. Ewingella americana is a Gram-negative rod, and the only species in the genus Ewingella. It was first identified and characterized in 1983. Ewingella is in the family Enterobacteriaceae. The organism is rarely reported as a human pathogen, though it has been isolated from a variety of clinical specimens, including wounds, sputum, urine, stool, blood, synovial fluid, conjunctiva and peritoneal dialysate. The bacterium is named in honor of William H. Ewing, an American biologist who contributed to modern taxonomy. The PilZ protein family is named after the type IV pilus control protein first identified in Pseudomonas aeruginosa, expressed as part of the pil operon. It has a cytoplasmic location and is essential for type IV fimbrial, or pilus, biogenesis. PilZ is a c-di-GMP binding domain and PilZ domain-containing proteins represent the best studied class of c-di-GMP effectors. C-di-GMP, cyclic diguanosine monophosphate, the second messenger in cells, is widespread in and unique to the bacterial kingdom. Elevated intracellular levels of c-di-GMP generally cause bacteria to change from a motile single-cell state to a sessile, adhesive surface-attached multicellular state called biofilm. Suttonella indologenes, formerly Kingella indologenes, is a Gram-negative rod-shaped bacterium of the family Cardiobacteriaceae. Like other members of its family, it is a bacterium that is assumed to be normally present in the respiratory tract. It has been found to rarely cause endocarditis, an infection of the heart valves. It also been found in the eye. It may cause eye infections. Little is known about it as a bacterium other than its structure and biochemical composition. Like other members in its family, it has a characteristic 16S ribosomal RNA which consists of 1474 base pairs. Streptococcus tigurinus is a novel member of the genus Streptococcus that was first discovered in 2012 by Swedish researchers. Parvimonas micra is a Gram positive anaerobic coccus which is frequently isolated from dental plaque in patients with chronic periodontitis. It is the only species in its genus, and is a common constituent of mixed anaerobic infections such as intra-abdominal abscess. It has rarely been implicated as a sole pathogen in septic arthritis, osteomyelitis and discitis associated with recent dental procedures. ↑ Yagupsky P (2004). "Kingella kingae: from medical rarity to an emerging paediatric pathogen". Lancet Infect Dis. 4 (6): 358–67. doi:10.1016/S1473-3099(04)01046-1. PMID 15172344. 1 2 Petti CA, Bhally HS, Weinstein MP, Joho K, Wakefield T, Reller LB, Carroll KC (2006). "Utility of extended blood culture incubation for isolation of Haemophilus, Actinobacillus, Cardiobacterium, Eikenella, and Kingella organisms: a retrospective multicenter evaluation". J. Clin. Microbiol. 44 (1): 257–9. doi:10.1128/JCM.44.1.257-259.2006. PMC 1351967 . PMID 16390985. ↑ Kehl-Fie TE, Porsch EA, Miller SE, St Geme JW (2009). "Expression of Kingella kingae type IV pili is regulated by sigma54, PilS, and PilR". J. Bacteriol. 191 (15): 4976–86. doi:10.1128/JB.00123-09. PMC 2715724 . PMID 19465661. ↑ Kehl-Fie TE, Porsch EA, Yagupsky P, Grass EA, Obert C, Benjamin DK, St Geme JW (2010). "Examination of type IV pilus expression and pilus-associated phenotypes in Kingella kingae clinical isolates". Infect. Immun. 78 (4): 1692–9. doi:10.1128/IAI.00908-09. PMC 2849430 . PMID 20145101. ↑ Ceroni D, Cherkaoui A, Kaelin A, Schrenzel J (2010). "Kingella kingae spondylodiscitis in young children: toward a new approach for bacteriological investigations? A preliminary report". J Child Orthop. 4 (2): 173–5. doi:10.1007/s11832-009-0233-2. PMC 2839857 . PMID 21455474. 1 2 Kiang KM, Ogunmodede F, Juni BA, Boxrud DJ, Glennen A, Bartkus JM, Cebelinski EA, Harriman K, Koop S, Faville R, Danila R, Lynfield R (2005). "Outbreak of osteomyelitis/septic arthritis caused by Kingella kingae among child care center attendees". Pediatrics. 116 (2): e206–13. doi:10.1542/peds.2004-2051. PMID 16024681. ↑ Ramana K, Mohanty S (2009). "An adult case of urinary tract infection with Kingella kingae: a case report". J Med Case Rep. 3: 7236. doi:10.1186/1752-1947-3-7236. PMC 2726550 . PMID 19830146. ↑ Banerjee A, Kaplan JB, Soherwardy A, Nudell Y, Mackenzie GA, Johnson S, Balashova NV (2013). "Characterization of TEM-1 β-lactamase producing Kingella kingae clinical isolates". Antimicrob. Agents Chemother. 57 (9): 4300–4306. doi:10.1128/AAC.00318-13. PMC 3754283 . PMID 23796935. "Kingella kingae". NCBI Taxonomy Browser. 504.